Our numbers are really dwindling now, and the weather returned to a more spring-like state, which is typical of Maine in June. But none of that is going to stop our fun! 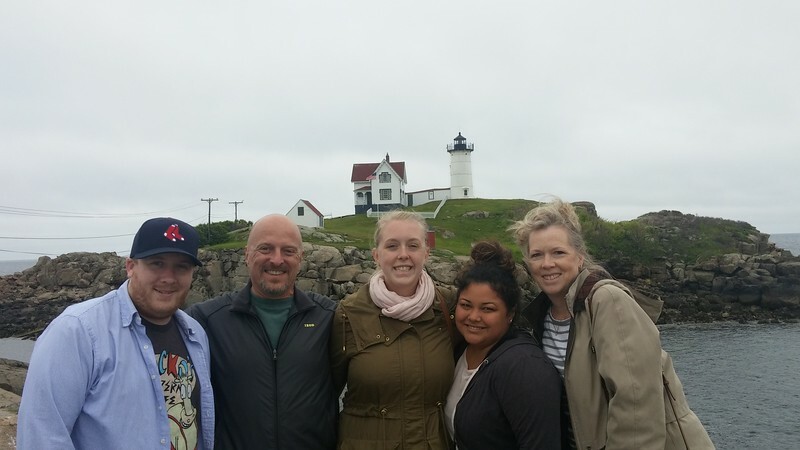 There's still shopping to do, plus a trip to Nubble Light. And we actually had a new guest arrive! Iona joined us on her mammoth road trip up the East Coast. We met up with her (and Cary and Jim as well) at Flatbread Pizza in Portsmouth, New Hampshire (only about 20 minutes from Ogunquit), for yet another awesome dinner. Afterwards, Iona and Heidee headed off for a few days in Boston, while the rest of us spent one last night at the hotel (albeit in the nice warm den, rather than out on the deck).